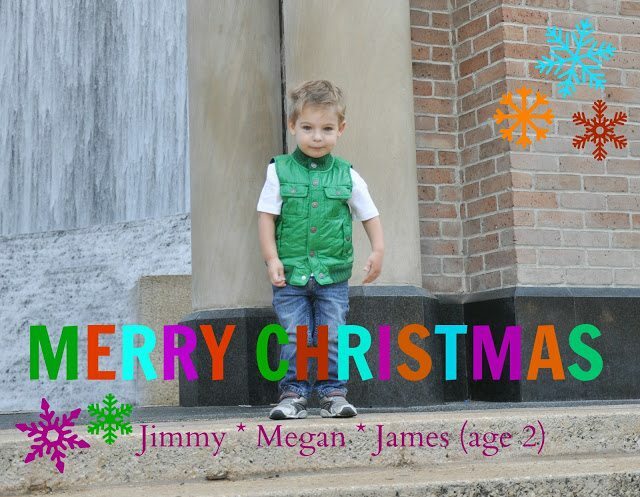 This year I’m sending out a picture of James inside our Christmas cards that I had some fun editing in PicMonkey. I wanted to share with you how I did it in case you aren’t familiar with the free online editing tool. It’s super easy to use and I edit almost all of my photos in it. I wish I knew how to use Photoshop, but I find PicMonkey works well for my purposes. Here’s the end result for the picture that will be included in our cards for 2012. Below is the out-of-the camera shot that I used for the photo. It’s a great straight on, in-focus shot of James with a cool background given the water fall and brick wall. The random guy and stroller need to go, obviously. 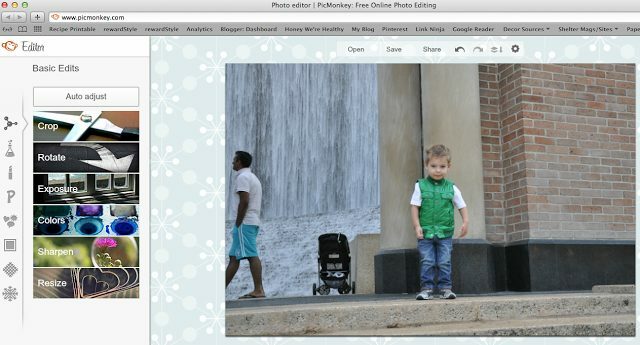 To begin editing, go to Pickmonkey.com and click on “Edit a Photo”. 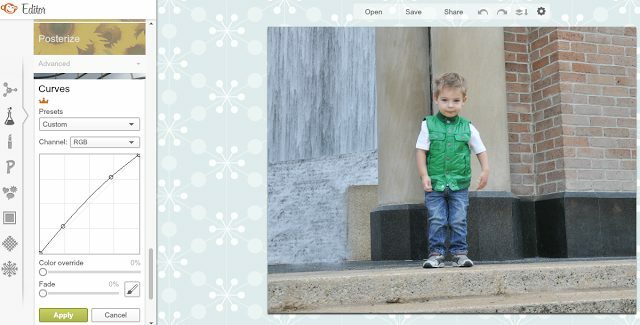 You can choose the photo from your computer library or drag the photo into PicMonkey. First, I used the cropping tool to crop the image. Then I used the Clone tool to copy the water fall to cover the stroller. 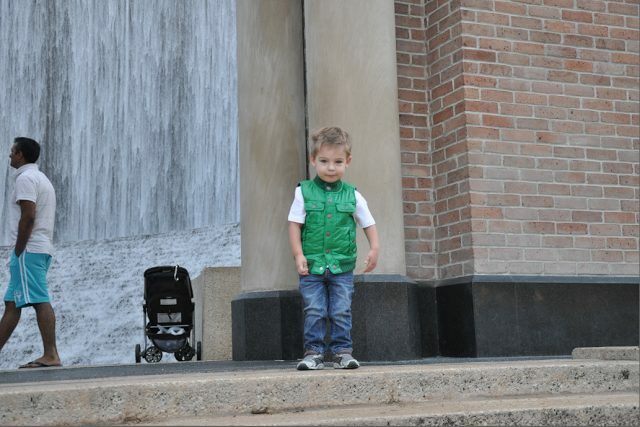 Voila- no more stroller! It’s not perfect, but close enough. To lighten the photo without over exposing it, I used Curves. You can also lighten your photos in “Exposure” and take out any yellow or warm tones in “Color”. To write on the photo, I clicked on the “P”, then chose my desired font. You can resize and move the words around too. Then I used the color editor to color each letter a different color. I then chose the winter application to add snowflakes. 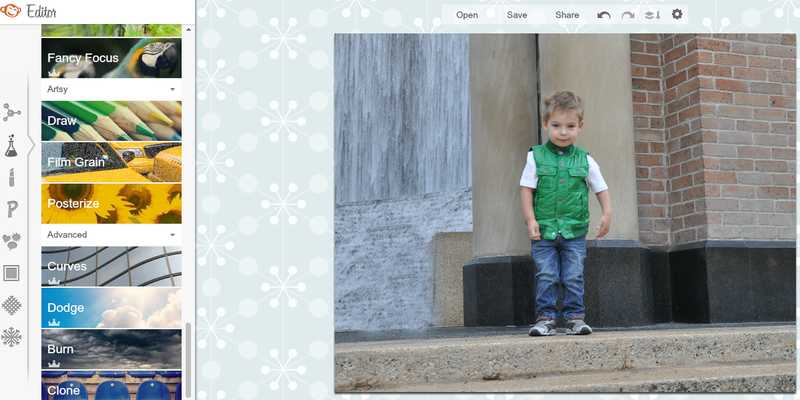 PicMonkey has all kinds of cool effects for different seasons. And then I colored the snowflakes to compliment the words Merry Christmas. Finally, just Save your image. I print my photos at Walgreeens. You can just go to their website and upload your photos from your computer there. They always have coupons and can print your photos in an hour. You could also print them at home on photo paper or card stock. Here’s the finished result. Too cute! This is awesome! 😉 Thanks for sharing! I am def going to start using it! Thank you! I adore him. Cute pic! Love how it turned out. I might have to try this option as I'd love to save a few extra dollars this year on cards. Thanks for the step by step! Oh my gosh… genius! 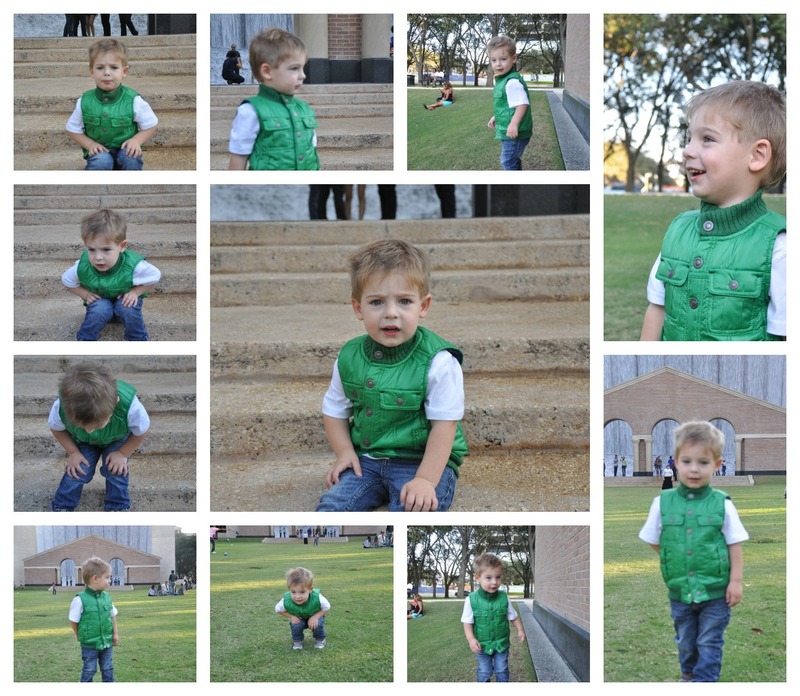 I had NO idea that there were that many photo editing options in picmonkey! So awesome! You will have so much fun with your little guy on that site now! He is precious!!! That turned out so cute. I got so sucked into that program that I ended up making three different versions and couldn't decide. I need to learn how to make up my mind. I love the colors you added. I could spend hours on there- so many options especially now with their holiday tools. he's so handsome! 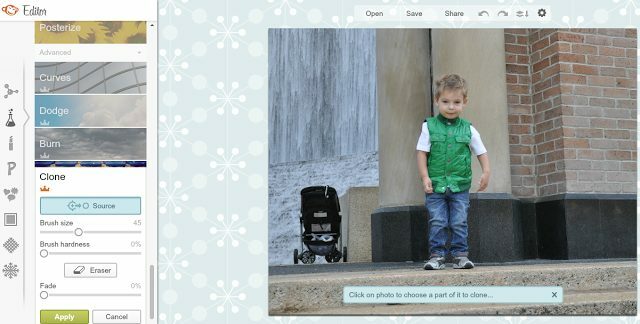 i did use picmonkey for Aston's thanksgiving holiday greeting photo – so easy! Megan, how you keep up with so many great things and raise a 2-yr. old is beyond me! Thank you for this, I love it. You are the bomb!! Please keep all the great stuff coming! 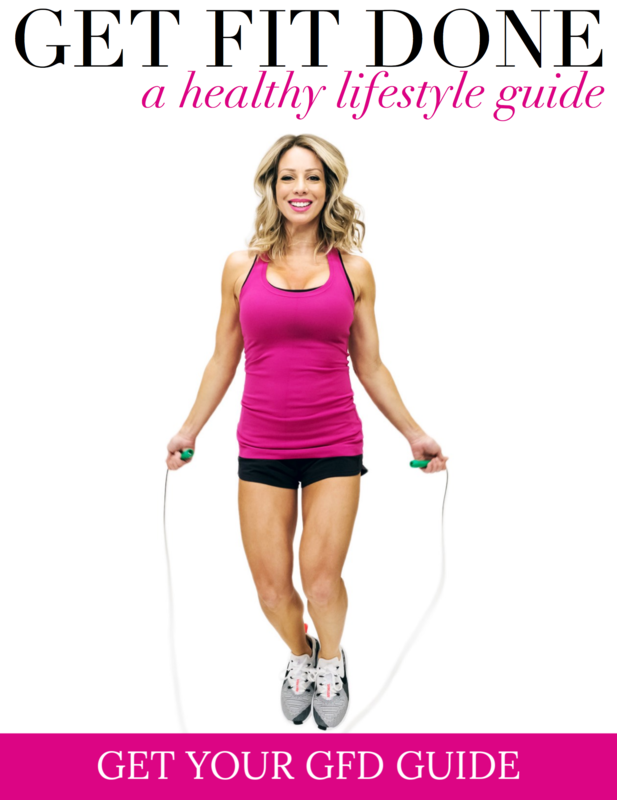 Loving the healthy site too. xo-M.
What a cute card, love it! 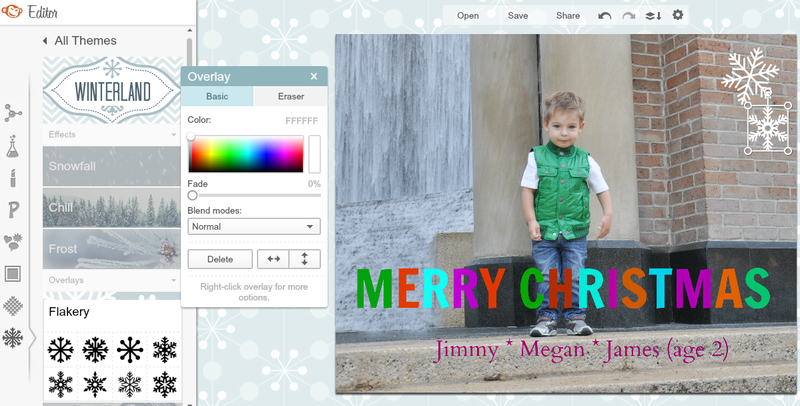 PicMonkey is hands down my favourite 'toy' at the moment, my card and gift tags are still a work in progress. Niiiice. I am super excited about my card, too! Every year it's way different than the last– but always a pic of everyone! So nice to share something for the holidays that WE made OURSELVES, isn't it?! What a great idea! This turned out really cute! I love PicMonkey! Cute Picture! How do you takes pics of your computer screen as you work? It's a screen shot. You can google how to do it since there are different ways depending on what type of computer you have. I have been reading your blog for a while now but I am commenting for the first time. 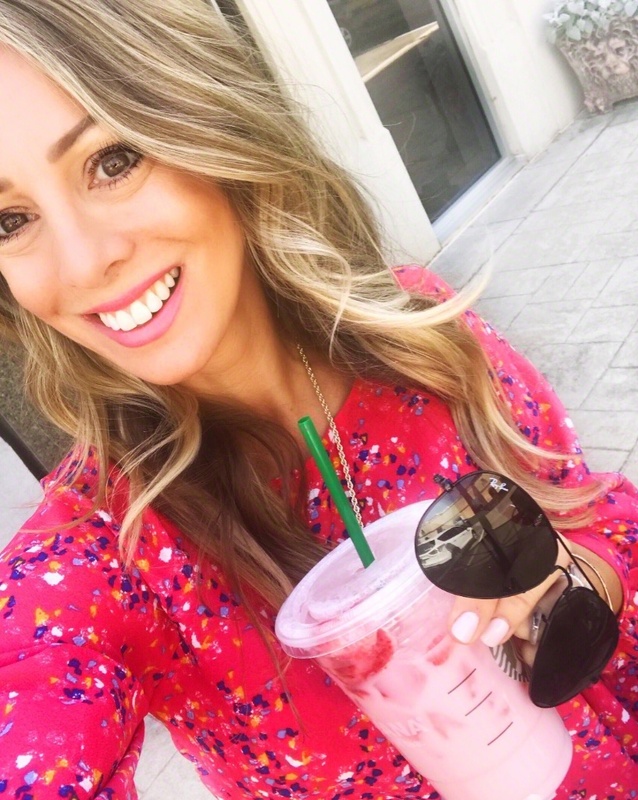 I love your blog and get so many inspirational ideas from it. I have implemented so many ideas from it such as the little coffee station in your kitchen and organizing books according to color. This is such a cute picture of your son. Thanks for posting this coz I really needed to learn how to make our own Christmas card and to do general editing of pictures. I will be reading this post a ton of times. 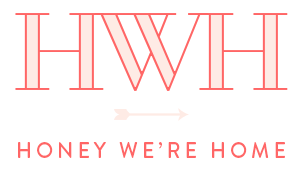 Thanks again for your cool blog! 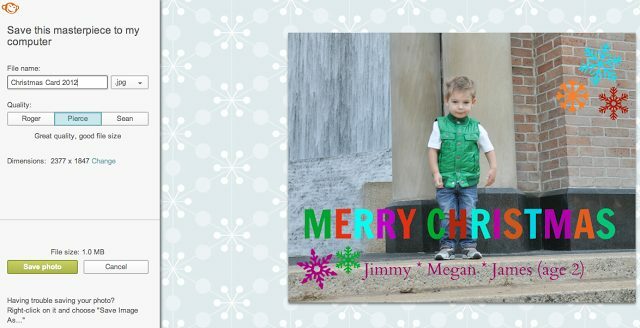 Adorable picture, Megan, and I love what you did with it! I love picmonkey! He looks adorable in every pic! this is genius will def have to check it out! Aww…so cute. And, LOL. Try doing it with 2 or more. The girls are almost 23 and 19 and I had to take 100! My hair doesn't look right, I'm squinting, her eyes are shut, on and on and on!! Thankfully Elie is the Master at creating photo cards. Love these tips! I just started using picmonkey to edit photos for my blog because I'm afraid of and don't know how to use photoshop. Also, photoshop is not cheap, especially if you don't know what you're doing (like me!) Can't wait to use these tips on picmonkey! So cute!!! 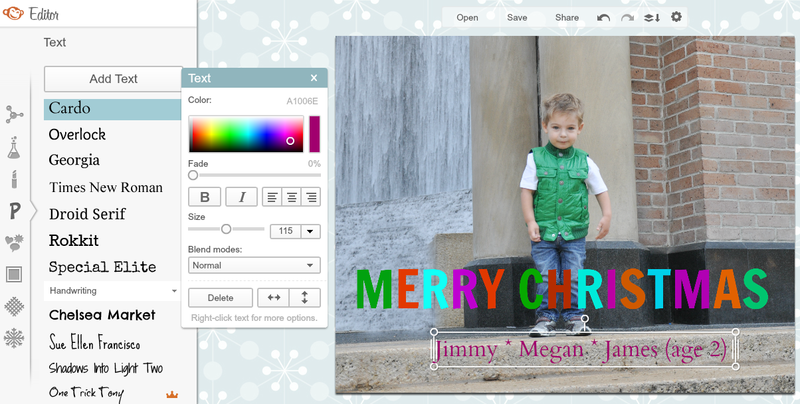 I love picmonkey! Good to know PicMonkey can do all this. And adorable picture! HI. I'm Julie. The Stalker. James is so cute! Such a fun card you created Megan. I have to check out Pic Monkey now. I was fiddling around with PhotoShop and getting so overwhelmed. Megan, he is so sweet and such a cutie pie. I'm using PicMonkey for our cards this year too! 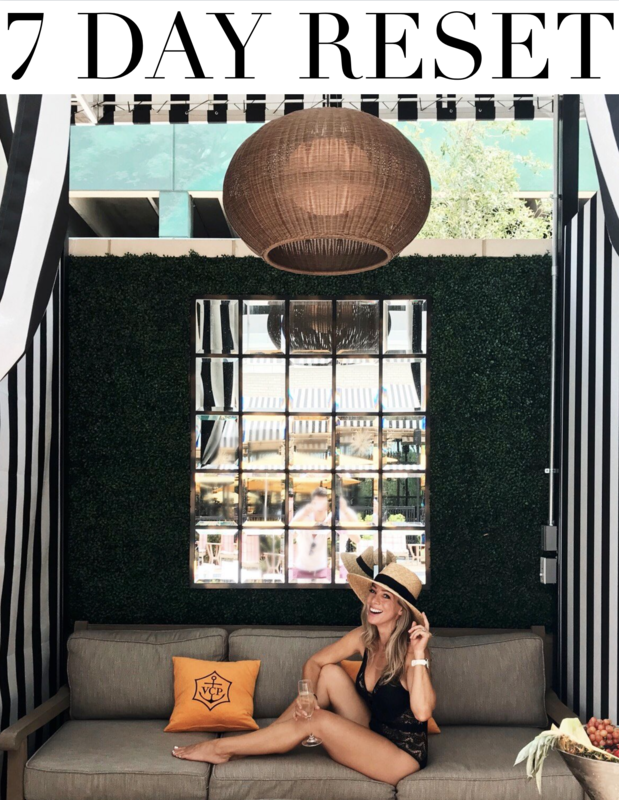 Love the way your photo came out! it doesn't get easier taking their picture. Mine are 6 and 8 and I still have trouble getting a good shot of them together! Gotta check their website! Thank you for the info. I love picmonkey!! Lovely card you made! !